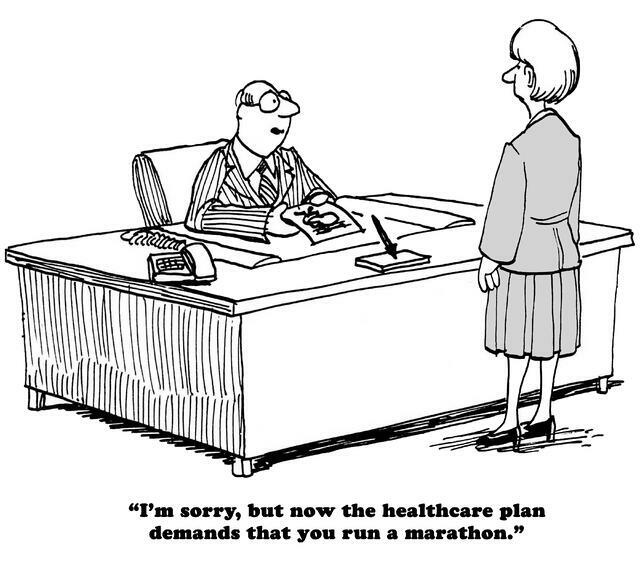 Although this cartoon is a bit extreme, it's true that many organizations continue to use "mandated" health or "carrot and stick" type incentives as an attempt to engage employees in health or safety initatives. Research on motivation (like self-determination theory) suggests that while these these types of extrinsic incentives may produce short-term compliance, they can also lead to resentment and may squash internal motivation necessary to support sustaining behavior change. What most employers really want is to create a culture where people choose in for their reasons. Where they chose to take ownership (accountability) over their health and wellbeing and support others in doing the same. They'd love to have a culture of health and safety - meaning "it's just the way we do things". In many of the organizations we work with (particularly manufacturing or laborer groups), employers and management perceive their employees are "CAVE" people (Chronically Against Virtually Everything). From their perspective, this comes with good grounding - participation in well meaning wellness or safety initatives has been low; and their people continue to engage in unhealthy and unsafe behaviors despite large incentives. Our experience is that despite this perception, most employees desire something that truly supports their personal health and wellbeing. They feel high levels of stress and recognize the negative impact on their personal lives – though often perceive there are no options for support that fit with their time and cost constraints or that will work for their health/mobility limitations (“I’m not fit enough to participate”). Further, many traditional wellness efforts are viewed as short-term events and "flavor of the month" by employees. So how can you support these employees to join in? Further, how to support JOINING IN for their OWN reasons and because they want to without external incentives? In our experience, one of the most valuable ways to impact engagement in a real way is to shift how we (as leaders or facilitators) show up. We find that several shifts in how we interact creates space for even the biggest CAVE person to choose in. When I first started doing this work, I thought it was a waste of time to have everyone introduce themselves and connect with each other. We had limited time and I had so much I "needed" to "teach" them! Certainly if the meeting is about providing information, you should get right to the point. When our desire is to create an environment that supports individual awareness and new action, our role shifts from "telling" to engaging people in a way that empowers them to choose in for their own reasons. One of the most important things we can do if this is a goal, is to first connect as human beings. Regardless of how resistant they appear, when we do something simple like asking them to engage in small groups each other around something they're excited about outside of work or what health means to them - barriers start to break down and people realize we care about them - not just their biometric numbers or health care costs. Traditionally in wellness we like to tell people what they need to do. Walk 30 min/day, lift weights 3x/week, eat this not that, meditate for 10 min a day, etc. While this type of specific prescription can be helpful for some people individually, it can also serve to generate resentment when we're interacting with a large group or whole organization. An important shift can be to acknowledge that when it comes to wellbeing broadly, people are complex and we can't always know what's best for them in that moment or in their environment. In our experience, most people know what they need to do. They are their own best experts when it comes to wellbeing. What is most relevant to them can change from moment to moment. Our job as facilitators and coaches is not to make them wrong for where they are or the choices they're making - but rather to provide a framework and allow people to find their own relevance. One way we make this shift is to emphasize that we have A way, not "THE" way. It's a shift from being the "expert" to recognizing everyone is their own expert and we authentically value each persons perspective and experience. Learning is often viewed as an intellectual exercise only. In wellness and safety, that often means spending a lot of time and energy on powerpoint presentations to provide information - only to get frustrated when people go back to the same behaviors. If we view learning as "the ability to take a new action", then with an intellectual only exercise, you really haven't learned anything. We like to say that "the mind understands, but the body learns". To really learn, we need to embrace the intellect, body and emotional aspects of ourselves. It's the difference between reading about driving a car and actually driving a car. We find that creating experiences that allow people to feel something different right away (without making them wrong or placing judgement on how they "should" feel, or what they "should" do..), can open up possibilities and allow them to find relevance for themselves. Historically, wellness screenings and biometrics or health coaching are seen as a one:one process designed to protect individual privacy... and rightly so. However, when we want to create a supportive culture, we find that bringing people together in cohorts and facilitating authentic, meaningful conversations and experiences can turbo charge possibilities and actions. When people talk to each other in a real way, they have the opportunity to resonate with someone who is "like me". We find that when we create an environment that supports people, they want to share, hear each others stories and connect around things they care about. No matter how amazing an initial event or experience, the real learning comes from taking new actions and creating new practices. We also find that if there's not an intentional support system when people leave, they can be more resentful on the back end. (Theoretical frameworks like the Socio-ecological-model help explain that we need to address multiple levels of from individual to policy level). In our experience, providing a real opportunity to extend the learning and become leaders in the culture can shift how people show up and support sustaining practices. We know that people are more likely to engage when it is people like them leading the way. We are always suprised to see some of the biggest resisters stepping up and becoming the biggest champions. Our experience is that, when you acknowledge where employees are and the challenges they face (rather than making them “wrong” for where they are) and create an environment that allows people to see relevance for themselves - they step-in to not only participate and embrace programs, but to also create them and advocate for their peers and families to join. As this spreads, a culture of support and accountability emerges that is driven by the employees and impacts not only individual health and wellbeing, but also deeply impacts the overall performance of the organization. The opportunity is to shift the behavior of the individuals and to create a culture with in the organization that is underpinned by accountability and caring for each other and supports a culture of health, safety and high performance. We always enjoy talking about what's working and what challenges you face in your workplace. Click below to contact us and schedule a free initial consultation.